«Sintratec S2», the new compact system for selective laser sintering (SLS), celebrates its world premiere at Formnext in Frankfurt am Main (Hall 3.1, Booth G79). The brand-new 3D printing system is suitable for manufacturing prototypes as well as optimizing application designs of small- and medium-sized series. 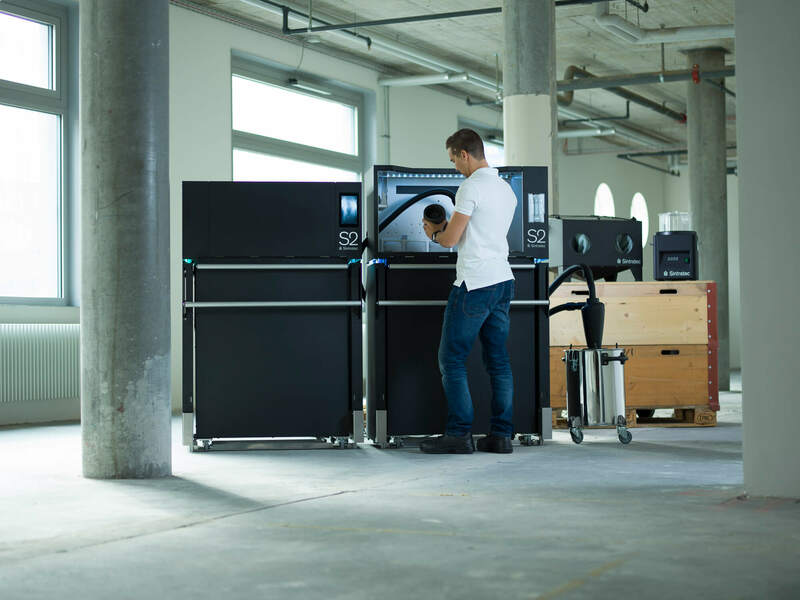 Frankfurt am Main, November 13th, 2018 – Sintratec, the leading Swiss developer and manufacturer of 3D printers for professional use, presents at Formnext a compact system for industrial additive manufacturing for the first time. 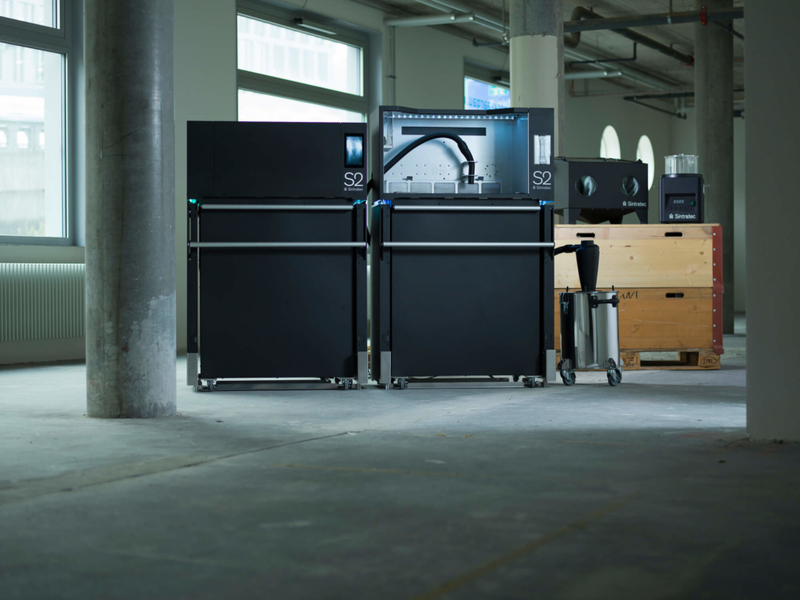 The brand-new system solution «Sintratec S2» is – like both predecessor printers «Sintratec Kit» and «Sintratec S1» – based on selective laser sintering (SLS) technology. New and unique in the SLS field are the all-in-one integrated and semi-automated processes of laser sintering, de-powdering, material preparation and surface treatment. Thanks to this end-to-end solution users benefit not only from precise printed objects with an exceptionally high degree in freedom of form, but also from an economic operation with significant reduced down times. Another advantage: tedious cleaning processes are no longer necessary. In order to receive consistent und homogenous print results, the Sintratec Laser Sintering Station is equipped with a cylindric printing area consisting of a new heating and ventilation concept. The integrated 4K camera enables the user to control print jobs and evaluate the surface of every print layer in real time. Moreover, the precise laser scanning system ensures an enhanced process repeatability and a faster printing speed. The 3D printing system is operated intuitively through a modern touch screen. The complete built chamber is situated in the Material Core Unit, which can easily be removed from the Laser Sintering Station. 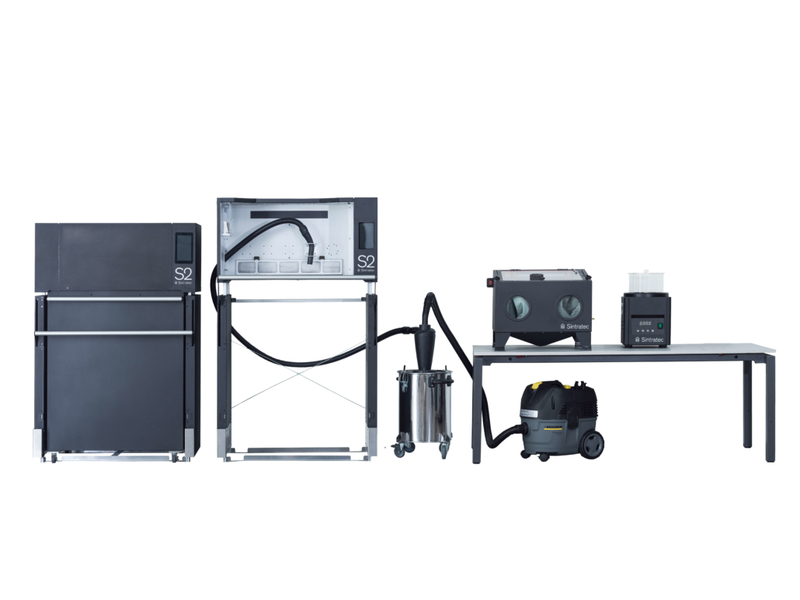 In addition to that, the Material Core Unit is equipped with an integrated powder mixing function that allows convenient powder handling. If the user wants to process different materials, he easily expands his system with another Material Core Unit. The Sintratec Material Handling Station collects used as well as excess printing material in a clean way and sieves it for reprocessing. If the SLS parts need to have improved surface qualities and be visually attractive, the blast cabinet Sintratec Blasting Station does the job. Finally, the Sintratec Polishing Station, a magnetic tumbler, seals surface impurities and lends the printed components a smooth, stainless-steel like finish. By means of the Sintratec S2, previously unimagined potential for professional prototyping can be unleashed. The smart System is especially suitable for developing and optimizing applications of tomorrow. Based on Sintratec’s experience, for example, the development of complex components can be improved by making designs suitable for 3D printing processes. This leads to tangible benefits both from the creative and the economic perspective. And once engineers have perfected their application, the Sintratec S2 solution is backing businesses up in going to market. Sintratec presents the unique production system for generative manufacturing at Formnext in Frankfurt am Main. The Swiss manufacturer thereby now gives engineers the possibility to produce high-quality SLS prints in an affordable way. Thanks to the modular design of the Sintratec S2 users can expand their production capacities as required by adding specific Sintratec S2 modules. Purchase reservations are accepted from now on. Sintratec exhibits at Formnext 2018. Visit us in hall 3.1, booth G79.